Dr. Somchai’s refractive surgery experience dates back to 2002 and has performed more than 10,000 LASIK and 2,500 SuperSight Surgery procedures. He has trained with many leading specialists and pioneers in refractive surgery. He uses the most modern state of the art laser and surgical techniques. Dr. Somchai received his medical degree and completed his ophthalmology residency at Chiangmai University. Dr. Somchai is a member of numerous medical and ophthalmic professional organizations including the European Society of Refractive Surgery, American Society of Cataract and Refractive Surgery and The Royal College of Ophthalmology of Thailand. Dr. Somchai has also been the team eye physician of Bangkok Hospital Pattaya. 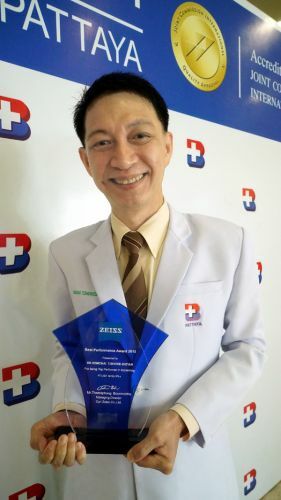 His team has been awarded the Customer Service award from Asian Hospital Management Award in the year 2006. He is an artist who loves painting and loves to spend time with his wife and little daughter.